Sunday’s clash with Fulham was needlessly stressful – Sadio Mané’s crisp finish was cancelled out by Ryan Babel capitalising on a rare mix-up at the back between Alisson and Virgil van Dijk. But, with nine minutes to go, we found a way to win when James Milner blasted a penalty down the middle of the goal after Mané was dragged down in the box. 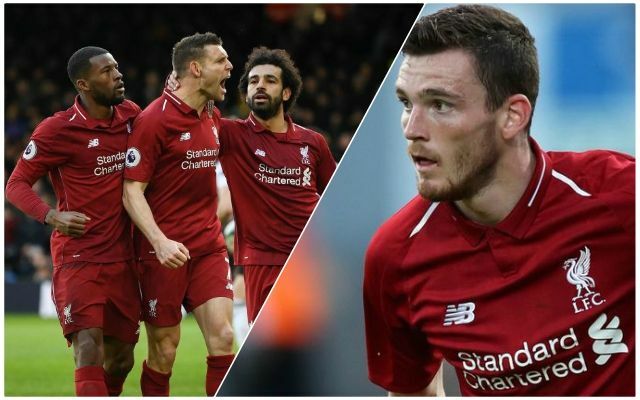 Speaking to Liverpoolfc.com after the match, Andy Robertson echoed the thoughts of all Liverpool fans: “It was massive for us. It would have been a bit gutting had we not got the three points, if I’m honest. “The first half, we dominated them and even in the second half we were very much in control up until the unexpected mistake. Robbo also understands that at the tail end of the season most teams are fighting for something – whether its a place in Europe or avoiding relegation. “It’s very rare that teams aren’t playing for anything at this time of the season so people start fighting and giving it their all. Luckily, we had enough in the tank,” he explained. “[It was] a massive week for us. Obviously beating Burnley at home was difficult, as they are in a similar position to what Fulham are in, and we fell behind there. Milner – who took the blame away from Virgil van Dijk for Fulham’s equaliser – is a player with huge amounts of experience. He was the embodiment of cool-headedness when he took that penalty despite being at fault for their goal. “[He is] the most experienced guy in our dressing room and he’s already got the trophy we are all fighting for because he’s already won it,” Robertson said of the 33-year-old. “His experience is crucial for us and he practises them every day; when he steps up, he’s confident and put it down the middle and sent the ‘keeper the wrong way. Another player who is full of belief at the moment is Mané and the Glaswegian was full of praise for the Senegalese star: “He could have had a few more actually but the goal he scored just shows you how confident he is just now. Robertson hasn’t scored for us since the final day of last season against Brighton. Although he’s got eight assists in the league it would be nice to see him smash one into the back of the net soon. Looking forward to it to Andy!